We at Pearls Only really love pearl fashion especially when art, accessories and pearls come together and make a master piece. This amazing clutch bag is definitely an example of art at its finest! 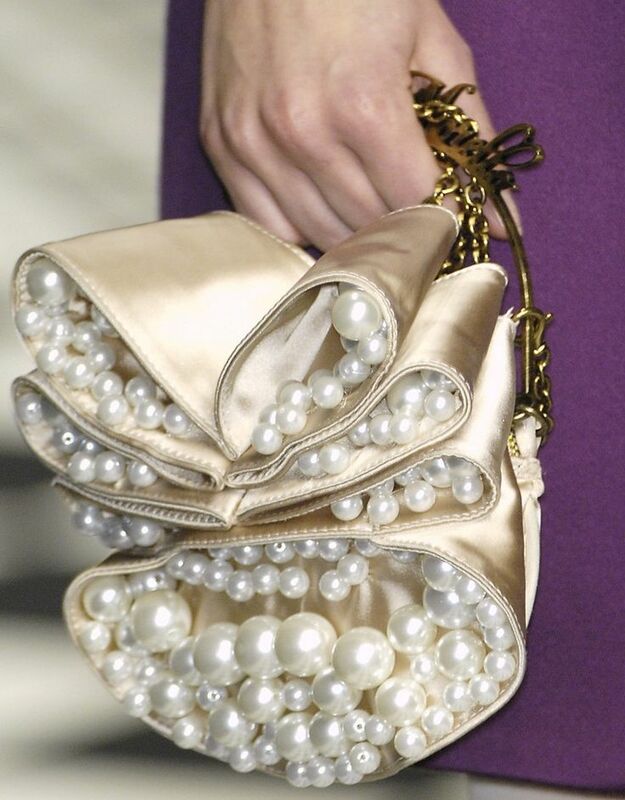 This pearl beauty is a Frankie Morello pearl clutch. Isn’t it gorgeous? We can just imagine the look of admiration when this clutch escorts you to the next cocktail party or any evening event where you show off your style. We love the loads of delicate pearl detailing along the soft and beautiful champagne silk material bunched together into a unique bow. The chain with “Morello” wording is the perfect accent and to the handy fashion statement. What do you think of this fashion-forward clutch? Would you wear this when you’re out and about? This entry was posted in PearlsOnly and tagged chic, clutch, fashion, Frankie Morello Pearl Clutch, pearl, Pearl Fashion, Pearls, style by PearlsOnly Team. Bookmark the permalink.